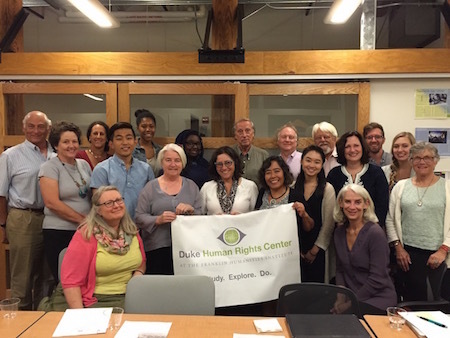 The Duke Human Rights Center @ the Franklin Humanities Institute brings together an interdisciplinary group of scholars, staff and students to promote new understandings of and action on human rights. We engage with issues of race, ethnicity, gender, sexuality, religion, income inequality, the environment, the philosophy and history of human rights, the literature that emerges alongside it, linguistic rights, and artistic responses in our research, teaching, programming and outreach. Our goal is to foster strategies and collaborative, cross-disciplinary and critical thinking about human rights in both local and global contexts. The Center is committed to social justice. In partnership with the FHI, we see the humanities as an essential frame and launch point for inquiry. We develop undergraduate courses and global experiences, sponsor campus-wide events that encourage awareness and activism on human rights and engage in long-term partnerships with community-based organizations. The Center is dedicated to teaching and practicing human rights both at home and abroad. As a university entity, we encourage our students to think deeply about human dignity and rights at the same time that they understand their history, development and practice. With this in mind, we take this extraordinary opportunity to reassert, for our faculty, staff and students, the critical importance of respect for human rights as a core value. Sexism, racism and hatred of the other based on ethnic origin, sexual orientation, disability, gender identity or religion are abhorrent and violations of basic principles of equality and mutual respect.